For many electric guitarists, single notes take priority on their time over chords. Single notes combined with techniques like string bends, hammer-ons and slides make for expressive solos - the spotlight moment that guitarists crave and love. Fundamentally, single notes are almost always the most prominent way for your diligent practicing to be seen and appreciated by others. In contrast, it can seem that chords are just part of a band's accompaniment and nothing too 'wow'. Will a Cmaj9 chord with a sophisticated mid fretboard open voicing really make that much of a difference over a garden variety C major? Maybe, maybe not - it all depends on the playing scenario. If you're jamming a standard blues rock 12 bar or covering a rock song, it's not likely to be that appreciated (perhaps even considered overkill). However, if you're playing in a jazzy blues combo or trying to figure out piano-like arpeggios for your newly composed song, chances are it will greatly enhance. 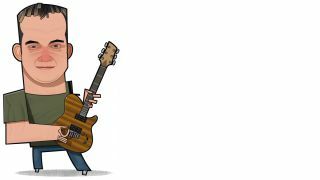 Thing is, as a developing guitarist that wants to be an all round musician (and reading Guitar Techniques magazine strongly suggests you are actively progressing), you don't want to end up with 'Popeye strength' soloing chops but kindergarden chord knowledge! So this coming month, I strongly suggest you tackle an area of your playing that is less well formed than others. Specifically, leave your Popeye strength areas well alone and delve into those weaker areas. You'll be the better musician for it, even to the point that your audience and/or band members may well voice their appreciation!